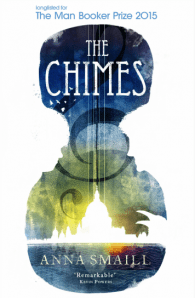 The Chimes is a novel about what might happen if the written word were replaced with music. It’s also about memory, mudlarking, acoustic location, love, and London. Anna Smaill is a classically trained violinist and published poet. Born in Auckland in 1979, she holds an MA in Creative Writing from the International Institute of Modern Letters (Wellington), an MA in English Literature from the University of Auckland and a PhD in contemporary American poetry from University College London. She is the author of one book of poetry (The Violinist in Spring, VUP 2005) and her poems have been published and anthologised in New Zealand and the United Kingdom. She has lived and worked in both Tokyo and London, and now lives in New Zealand with her husband, novelist Carl Shuker, and their daughter.